The 5 days Murchison Falls safari in Uganda and Budongo chimp trekking takes you to Uganda’s spectacular heritage with breathtaking beautiful allures and landscapes. 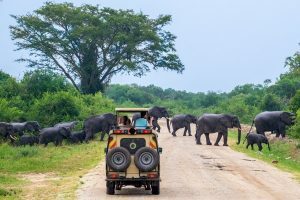 This wildlife safari in Uganda features the big five wild game sighting, a morning game drive, Nile delta boat cruise, Evening game drive, rhino tracking, boat cruise and chimpanzee trekking in Budongo forest. The magnificent Murchison Falls is created by the center piece of the thunderous waterfall that cascades 45m down the rift valley wall swarmed by a profusion of wildlife at the banks. As the water squeezes through an 8m gorge you will sight the best ever down pour that you will come so close to. Within the park are numerous wildlife species including the elephants, giraffes, leopards, lions, buffaloes, antelopes, Crocodiles, hippopotamuses and many more. 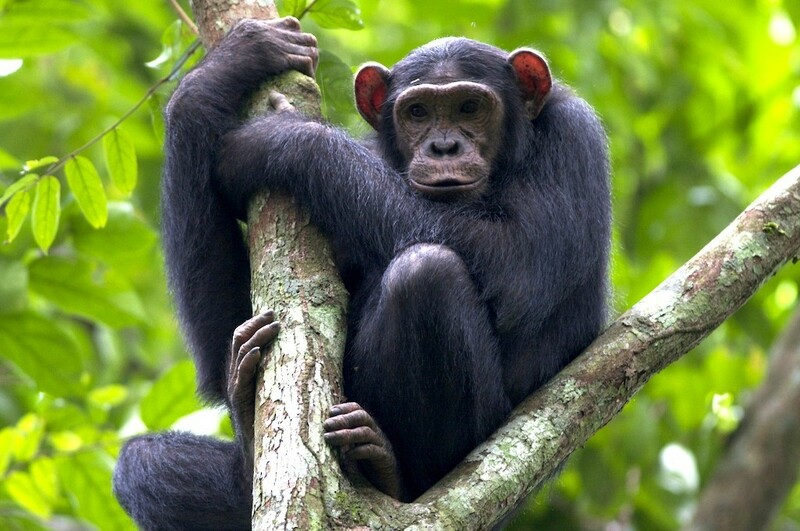 Just 114km from Murchison falls national park, you will trek chimpanzees at Budongo forest. 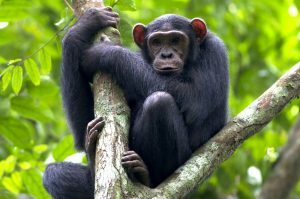 Humans share about 99% of their DNA with chimpanzees and coming so close to them as you gaze at them play, and curiously jump on the tree branches is something so amazing to encounter on a Uganda wildlife safari. Day 1: Your driver guide will pick you up from your place of residence and start the drive to Murchison Falls. 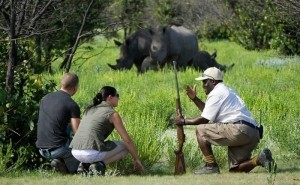 You will stop at Ziwa Rhino sanctuary for foot Rhino tracking. Day 2: You will do a morning game drive, have a lunch break and have an evening boat cruise at Murchison Falls national park. Day 3: The morning delta cruise will be the first activity of the day then have an evening game drive. Day 4: You will be driven to Budongo forest and then do evening chimpanzee trekking. Day 5: Drive back to Kampala or Entebbe international airport for departure. Your professional Uganda wildlife tour guide will pick you up from your place of residence as early as 7:00am and start the drive to Murchison Falls National park. The only home to Rhinos in Uganda known as Ziwa Rhino sanctuary is 164km from Kampala-Uganda’s capital. Here you will track rhinos for about 2 hours then continue your journey to Murchison Falls National park Uganda. Upon arrival, you will check into your prior booked accommodation in Murchison Falls National Park for dinner and an overnight stay. Be ready to be at the park by 7:00am for an early game drive. You will cross by ferry at 7:00am to the northern part of the park which is rich in wild game. The game drive lasts about 2-4 hours with sightings of wildlife like the leopards, lions, elephants, buffaloes, antelopes and many more that the luck of the morning brings. You will have a lunch break at your accommodation facility for about 2 hours where after you go for an evening boat cruise at 2:00pm starting from paraa jetty. 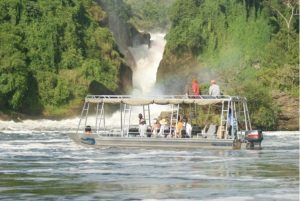 The boat cruise takes you below the splashing waterfall as you spot crocodiles, hippopotamuses and water birds for about 2 hours. On this 3rd day of your safari in Uganda, you will have an early morning delta boat cruise. This is an opportunity of sighting several bird species including the elusive shoebill. This region is very popular for water animals that you meet as you cruise. In the evening after lunch, you will go for another game drive. The evening game drive increases chances of sighting several animals that you probably didn’t see yesterday in the morning game drive. After your last breakfast close to the world’s most powerful waterfall, your driver guide will transfer you to Budongo forest for chimpanzee trekking. You will be amazed at the behavior of the chimpanzees as they play around and just walking through this forest is a great experience. The trek can either be a morning or an evening activity. In the evening you will have an overnight at a prior booked hotel within Budongo forest. The last day of your safari finally comes and you will have a relaxed break fast then be driven back to Kampala or Entebbe international airport for your departure flight. Wildlife interactions are amazing and in just 5 days you can have a chance to go for a Uganda gorilla trekking safari in Bwindi impenetrable national park or take a gorilla trekking tour in Uganda to Mgahinga gorilla national park which is close to the Rwanda gorilla safari destination of Volcanoes national park. When you visit Murchison falls national park, you will know why it is the most visited safari park in Uganda.